Where are the Mushroom Remedy’s products made? To ensure the highest quality, all of our products are manufactured in the United States in an FDA approved, CGMP (Current Good Manufacturing Practices) facility. CGMP refers to the Current Good Manufacturing Practice regulations enforced by the US Food and Drug Administration (FDA). CGMPs provide for systems that assure proper design, monitoring, and control of manufacturing processes and facilities. Adherence to the CGMP regulations assures the identity, strength, quality, and purity of drug products by requiring that manufacturers of medications adequately control manufacturing operations. This includes establishing strong quality management systems, obtaining appropriate quality raw materials, establishing robust operating procedures, detecting and investigating product quality deviations, and maintaining reliable testing laboratories. This formal system of controls at a pharmaceutical company, if adequately put into practice, helps to prevent instances of contamination, mix-ups, deviations, failures, and errors. This assures that drug products meet their quality standards. Gluten is proteins found in wheat, barley, rye, oat and other related grains. It is the glue that gives these gain products the elasticity to dough, to rise and give them chewy property. Gluten proteins themselves do not have much biological and nutritional value. However, some people are sensitive to gluten and that is why many products on the market are gluten free. GMO stands for Genetically Modified Organism. It is any organism (plant, animal, microorganism or other organism) whose genetic material has been altered using genetic engineering techniques. GMOs are used to produce many pharmaceutical drugs and medicine. It is also used in agriculture. Most developed nations do not consider GMO to be safe and we agree. Therefore, all of our products are made from NON-GMO ingredients. Veganism is the practice of abstaining from using all animal derived products. When it comes to dietary intakes, vegan is the strictest version of vegetarian. Dietary vegans refrain from eating any animal derived products which include egg or milk. People choose to be vegan for various personal reasons. Herbal supplements, sometimes called botanicals, have been used for medicinal purposes for thousands of years. They mostly consist of ordinary food or dietary substances. Most of these are derived either plants or fungus but do not have to be. Over the years, people have found some of these substances or combination of these substances to have certain benefits to improve or support their daily well being and start using them as supplements to their daily diet. In US, herbal supplements are regulated by the FDA, but not as drugs or as foods. They fall under a category called dietary supplements. What should the dosage be? Please refer to Mushroom Remedy bottles for the suggested Daily Usage. In addition, the recommended daily usage varies from person to person and it is based on many different factors – please consult your physician for your specific recommended use. If someone just started using one of our products, it is good to start at lower range of the Daily Usage for a week or two. If no negative side effect is detected then increase the daily intake to the upper range of the Daily Usage for two to four weeks to fully supplement the elements that the body maybe missing. Afterwards, you may reduce the daily intake from there to a comfortable level. 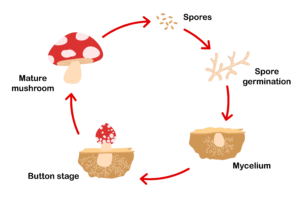 What is a mushroom lifecycle? The contents or ingredients of a mushroom are very different between all these stages. It is extremely important to harvest the mushroom at the exact stage for the desired benefits. Based on years of research and development, Mushroom Remedy follows a strict schedule for each of its products and always harvests its mushroom at the right time.